You might wonder - WHAT IN THE WORLD IS THIS !! It is nothing but as simple simple as some-ones home !! 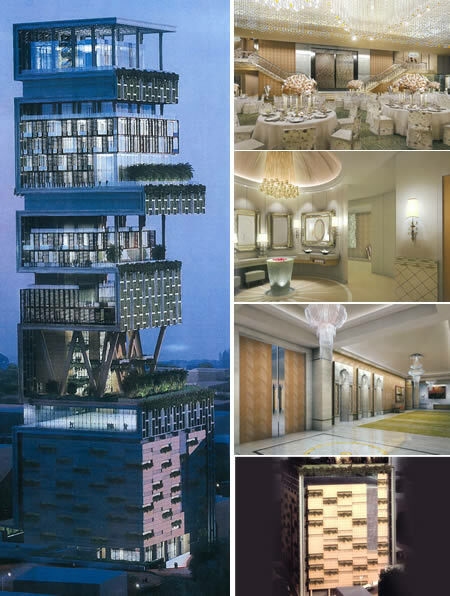 Do no ridicule this fact - it is Mr. Mukesh Ambanis House in Mumbai called ANTILLA. 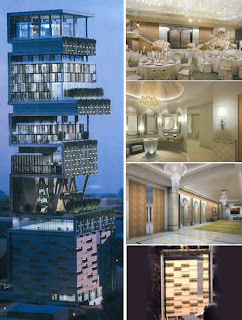 It is recorded to be the WORLDS most expensive house! It is a 27 storey building - impossible to put your finger on, what facility is NOT there! I got a good chance to get a close look at its top floor. My Uncle stays in a building namely "Kshitij" and his room faces the upper floors of this building. Having very powerful binoculars I innocently tried to 'peep' in their house - without realising that very obviously they have taken care of their privacy! Their walls are strongly double layers - preventing any sort of laser entry and their glasses are again layered - preventing any 'peeping' inside. Its current value is much more than 20 Billion Dollar. Also factually, it is the ONLY billion dollar house in the WORLD. What else did Mumbai need!